CPH recently released the newest volume in the Theological Commonplaces series: On the Law, in which Gerhard explores the moral Law of God, revealed in Scripture and nature, as well as all other kinds of laws, such as the ceremonies and civil laws of the Old Testament. The following excerpt from Commonplace XV discusses the moral Law. 14. However, one must not think that the moral Law began with the solemn publishing of the Decalogue or that it is held enclosed within its narrow confines. Rather, the moral Law was given and revealed to people even before that solemn publishing, immediately at the earliest beginning of the world. In fact, it was inscribed in their hearts at creation, since they were created in the image of God (Gen. 1:27), which consists of true righteousness and holiness (Eph. 4:24). The norm and mirror of this holiness and righteousness are set forth in the Law. Indeed, before the foundations of the world were set, this norm and rule of righteousness existed in God’s mind. The rabbinic scholars, who did not have a clear understanding of the teaching of their ancestors about this subject, converted this into worthless stories. According to Galatinus (Arcan., bk. 17, ch. 1, Advers. Judaeos) and Reuchlin (Cabala, ch. 3), they say, “God’s law was established two thousand years before the creation of the world and was written in dark fiery letters on a background of white fire.” People are commanded to be holy just as God is holy (Lev. 11:44; 1 Pet. 1:15). They are commanded to be merciful as our heavenly Father is merciful (Luke 6:36). They are commanded to be perfect as our heavenly Father is perfect (Matt. 5:48). Therefore surely God is holy, merciful, and perfect. But now, holiness, mercy, and perfection are not accidents in God but are His very essence. Therefore surely as God’s essence is eternal, so also God’s holiness, mercy, and perfection are eternal, and the expression and representation of His holiness, mercy, and perfection are set forth in the Law. The Law of Moses was given to no nation other than that of the Israelites and obligated no one else but the Hebrews: (1) because nowhere in the Bible do we read a command to Moses nor to any of the prophets to make known the Jewish Law among the nations in the way the apostles had a mandate to make the Gospel known; (2) because David says that God announced His just decrees and judgments only to Israel and not to other nations (Ps. 147[:19–20]); and (3) because circumcision applied only to the Jews, and the obligation of the Law of Moses lay in circumcision (Gal. 5[:3]). From Theological Commonplaces: On the Law, pages 15–16 © 2015 Concordia Publishing House. All rights reserved. 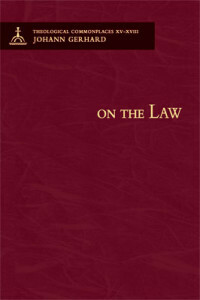 To order Theological Commonplaces: On the Law, please contact CPH at 800-325-3040 or visit www.cph.org.